As a pet owner, you are always curious to know the things about your pet, like when your pet likes to sleep or how long your pet sleep. If you are hamster owner and want to know how long hamsters sleep, then you have come to the right page. Hamsters are one of the crepuscular animals which mean they are very active during low-light hours at dawn and dusk. Your pet may spend a significant amount of time asleep when you are awake. Thus, if you like to play with your little hamster, then you might have to wake your pet. Also, when you see your pet sleeping all the time, it is very natural to wonder that “Why hamsters are napping all the time?” Hence, today’s post is all about exploring hamster, how much sleep hamster need, why your hamster is sleeping for a very long time, etc. Why Do Hamsters Sleep During the Day? What if Hamsters don’t get Enough Sleep? Where is kind of Environment right for Hamsters sleep? Do Baby Hamsters Sleep a Lot? Why Hamsters Sleeps a lot? The first of all, some might be a wonder to know “Do Hamsters sleep.” If you have your own hamster for the first time, and seeing your sweet little friend sleeping so much, you might worry about it. Also, you might end up thinking there is something wrong with your pet or you have to know about your pet’s sleeping patterns. Hamsters generally sleep during the full daylight hours, and they become active when the sun is hardly visible or invisible. So, the answer to the question will be yes, they nap during the daytime. To know how long hamsters sleep, first, you should understand why do they sleep during the day and awake during the night. In the natural environment, they are prey animals. Thus, it makes all sense that hamsters should go out to acquire food when there is less probability that there will be predators outside. That’s why they do food foraging during the night, and then, they sleep during the day. Fortunately, the food they acquire during the night can be stored, and that’s why they can consume at any time. Just like one human may require more sleep, while another human may need less sleep, daily routine can vary from one hamster to another. For example, one Syrian hamster may require more rest as compared to another one. And dwarf hamsters have been observed to acquire less rigid sleep-wake routine as compared to their Syrian counterparts. As a hamster owner, all you need to remember is that as long as your hamster is fit and healthy, your pet will sleep for a maximum of 6 to 8 hours per day. Thus, if your hamster is sleeping for more than 8 hours or if it is sleeping all day and night, then you should call or contact your vet. You should be familiar with your hamster sleep pattern as it is a way to take care of your pet. If your hamster doesn’t get enough daily rest, then your pet can suffer from some health issues. Insufficient sleep can result in the higher stress levels and your hamster may become more aggressive or can ever bite others. Also, sleep deprivation in pet hamsters can lead to memory impairment and the reduction in the performance of everyday tasks. Just as humans need power naps to do every task correctly, hamsters also need sufficient sleep to stay fit and fine. In the worst case, a lack of sleep can reduce their life span. Clearly, you don’t want your hamster to go through all these problems and thus, you should gather all the information about them. Only then, you will be able to analyze if there are some issues with the hamster. You should make sure that your hamster gets a cozy place or atmosphere to sleep in. It will provide them with a safe and secure space. You should place its cage where there is little disturbance during the day. As a pet owner, you have to make sure your hamster gets a good sleep. Also, bedding is essential for your pet to have good sleep. Amazingly, hamsters love to create their own little bed, and that’s why all you have to do is to provide the raw materials, such as fresh hay. Also, you have to clean the cage to maintain a healthy and sound environment. Make sure that the cage is cleaned correctly. 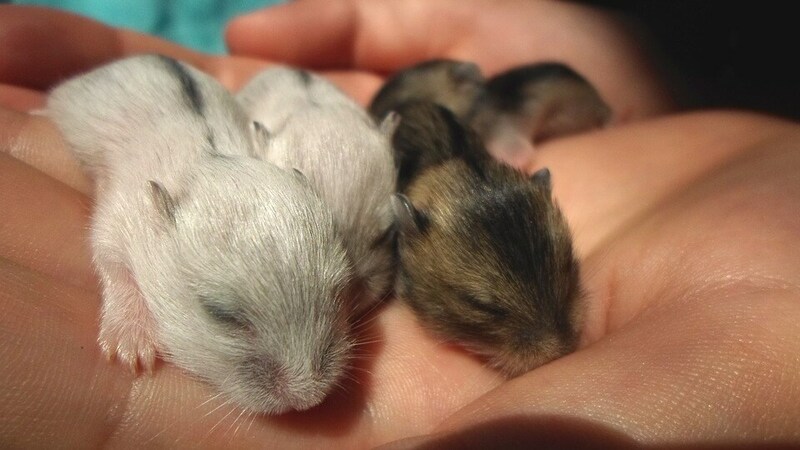 Hamster babies also called puppies, and they are born blind, deaf and hairless. They are entirely depended on their mother for survival after birth. Baby hamsters naturally sleep a lot. It indeed takes a lot of energy to transform from blind, hairless, deaf to become adult hamsters. And a large amount of sleep is required for this whole process. Thus, if you have adopted a hamster baby, then you must know about these things. Also, those who have chosen an adult hamster, they don’t have to care much about their adult pet. Little or younger pets require a special kind of care. If your hamster is exhibiting abnormal sleeping habits during the day and night, then it is possible that there is something wrong with your pet. The common reason why hamsters sleep for an extended period is that of the cold temperature. Another reason can be because of a lack of food and water. Insufficient diet can make your hamster sleep for a very long time. In this case, all you can do is to give healthy and sufficient food for them so that your pet can return back to its usual sleep patterns. Hence, now as a hamster owner, you know enough about how long hamsters sleep. Every pet owner should be aware of their pet’s sleep patterns. It is essential to avoid health problems to keep them safe. However, if you see your pet sleeping a lot, then you should consult your vet immediately for the sake of your pet.